Realme 2 Pro gives a feeling of being bigger in the hands. We had trouble using this phone with one hand, but it is not very heavy. The thickness of 8.5 millimeters will be considered wide, but the grip is good due to curved polycarbonate edges. There are many layers of lamination on the back of the phone, which makes it feel like its glass panel. Speaking of Reality, "Crystal-like DuDrop" effect. On this, fingerprints fall easily. 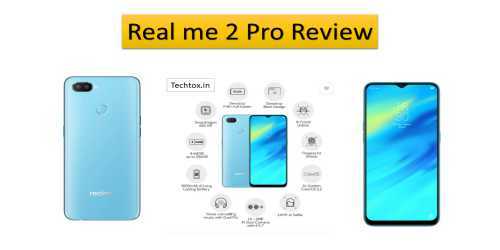 The specifications of Realme 2 Pro are very strong. The Qualcomm Snapdragon 660 processor is used in all variants, which is a power-full octa-core chipset. This chipset is available in Xiaomi Mi A2 (review) and Vivo V9 Pro in the price range of less than Rs. 20,000. Benchmark scores also justify its strong specification. We used the Realm2 Pro for many days. Honestly, we have no complaints. If there are some drawbacks of colorOS, the UI is usually smoother. While loading a game with multitasking or powerful graphics, we never realized the slowdown. The phone does not get too hot The area around the fingerprint sensor is a bit hot, after a long time playing the game or using the camera. Call quality is good and call recording in the dialer app is also built in. Realme 2 Pro has a 16-megapixel primary camera on the back, which is F / 1.7 aperture. It captures photos with details in Daylight. In Landscape Shot we got to see a good dynamic range. Small objects also come with lots of detail and accurate colors. Wide aperture brings good Bokeh effect in a close-up shot. We were not able to get a clear shot of moving object, but besides this, autofocus was working fast. The secondary 2-megapixel sensor does not work in the image capture process. Its job is to calculate the depth. Photos are good in portrait mode. Edge Detection is obvious. The sharpness of the object is also clear in artificial lighting. You have several lighting modes to choose from which have good effects. Photos in low light come in some grains. Details are also reduced, especially in landscape shots. Short-shot is less in the closeup shot. But in total, the photos come to be used. Videos of 1080p pixels come in good quality. There is an electronic image stabilization that works fine. There is also support for 4K recording. Quality is very average and no stabilization exists. The videos shot in low light come in the granny. Realme also has a 16-megapixel front camera. It comes with Bokeh effect, HDR and screen flash. Image quality comes in good shape. The details could have been slightly better. The screen flash is extremely effective. But this makes the tone of your skin confusing. There is also a steakers shooting mode with the help of which you will be able to find different AR stickers on the face of Selfie or others. The battery of 3500 mAh has been handy with ease. It lasted 10 hours and 22 minutes in our video loop test, which is slightly better than average. The phone does not support fast charging. But the charger with the phone charging the battery 64 percent in one hour. It took about 2 hours and 20 minutes for a full charge to be zero. Realme 2 Pro meets the claim of a powerful phone. We think it will tempt many people, especially its price. The phone has 8 GB of RAM and 128 GB storage variants of Rs 18,990. If seen, it appears more appealing than Mi A2 or VivoV9 Pro. Both of these phones come with Snapdragon 660 processors. The initial variant of the phone is 13,990 rupees. This will challenge Xiaomi Redmi Note 5 Pro, 6Gb RAM variant of Motorola One Power, Asus ZenFone Max Pro M1 and 6 GB RAM variants of Realme 1 (review). Sharpe and Vivid Display go in favor of Realme 2 Pro, good build quality, solid app, and gaming performance. Low-light photography and video performance can be better. We want to get rid of the problem of troubleshooting realm (and Oppo) notifications. By the way, if you are looking for an all-round phone call in the price segment of Rs. 20,000 then this is a great option.